The Candy Store Cup 2019 Superyacht Regatta is hosted and organized by Newport Shipyard and Bannister's Wharf and will take place July 25-27, 2019 in Newport, RI. The Candy Store Cup carries forward the tradition of the Newport Bucket and invites yachts over 90' LOA to race. Audrain’s Newport Concours & Motor Week is a celebration of the history of sportsmanship and motoring in Newport, Rhode Island. The Refit International Exhibition & Conference is a marine industry trade show combining exhibits, seminars, and demonstrations for yacht and boat refit and repair professionals. The Refit Show delivers a potent combination of practical education, emerging technologies, new products, service innovations, and B2B networking. Ivory Tower Holiday Party 2018! Thursday, Dec 13 from 5:00-8:00pm. New location on the 2nd & 3rd floors of the southeast building where our gym is located. Newport Harbor Illuminated Boat Parade is Friday, November 23, 2018 at 6:15pm (the day after Thanksgiving!) The boats will rendezvous at the Goat Island Causeway at 1800 for a prompt 1815 start. The parade will begin traveling east (clockwise around Newport Harbor) leaving Newport Yacht Club (where judges are located) to port. The route will continue towards King Park and lighted Bell #3. Boats will finish the least leg of the circle headed North back towards the Goat Island Causeway area. Newport Shipyard invites captains, crew, tenants and friends to join us at the Providence Bruins on Friday, November 9, 2018! The bus will leave from Newport Shipyard at 5:15pm. Cost is $35/person and includes: bus ride to/from Dunkin' Donuts center, 1 ticket to the game and food / beverages in the Shipyard private suites! Friends and family are invited. Visit the Dock Office or email Veronica Brown (veronica@newportshipyard.com) for more information and to buy tickets. When: The race will be held on Sunday, October 21, 2018 at 7:00 a.m.
2018 will mark the 17th anniversary of the original Sail for Pride. In 2001, in the wake of the terrorist attacks on the World Trade Center, Pentagon, and in the skies over Pennsylvania, a few local sailing enthusiasts scrambled to organize a regatta to honor and support those affected. The display of patriotism and generosity on and off the water made a lasting impression in the sailing community. After the inaugural year, the organizers retired the name Sail for Pride, but continued the event as Sail For Hope, reflecting the Rhode Island state motto and focuses on the mission to supporting local non-profit endeavors. Charities supported over the years have included RI Red Cross, Seamen's Church Institute, Newport Harbormaster's Emergency Equipment Fund, local public high school sailing teams, US Olympic Sailing Trials and many more. Those funds reached outside Rhode Island in 2005 when over $100,000 was raised after Hurricane Katrina's and send to New Orleans and the Gulf Coast. Newport Boxfit is coming to the Newport waterfront! Starting this Friday, August 24, Newport Boxfit will be offering a Boxfit class at Storer Park, next to Newport Shipyard. Classes start at 6:15am and the first class, on Friday, August 24th, is FREE for everyone! The class is a one-hour long full body workout that incorporates all the fundamentals of a boxer's work out. You'll do jump rope, shadow boxing, pad work, plyometrics, abs and lots of heart pumpinh exercises in a fun and motivating environment. This is the ultimate workout! Parking: Please park along Washington Street at the parking meters ($1.25/hour) or in the city of Newport parking lot across from Newport Shipyard. Sorry, but there is no parking in the Shipyard. Newport Shipyard co-sponsors a showing of the movie "WIND"
Wake up your body and clear your mind in this dynamic all levels yoga class that focuses on connection to mind, body, breath and nature. We will flow through breath-centered poses that target core strength, balance, and flexibility. Emily Moyer and other instructors from Newport Community Yoga will lead the weekly yoga classes and will offer modifications and variations to make this class accessible to all levels. Mats will be provided but please bring your own if you have one. $10/person. Classes will be held every Wednesday, from 5:15pm - 6:15pm on the dock (location each week TBD). About Emily: Emily Moyer is the owner and director of Newport Community Yoga who has been teaching yoga for eight years. Paddle around the historic Newport Harbor during the 9th Annual Newport SUP Cup, now called PADDLE FOR ACCESS benefitting Clean Ocean Access. Clean water and healthy oceans are definitely high on our list of priorities, but if we can’t get to the coastline to enjoy ocean activities, then we’ve got a major problem to solve. Limited access to the shoreline is how the organization started in 2006 and to this day it is the most important (but probably least understood) issue that we work on. What started as a simple program related to knocking down obstruction barriers has evolved into an effort that includes topics such as erosion, sea-level rise, invasive species and long term shoreline planning. In celebration of our ongoing work protecting and preserving shoreline access, we are hosting this SUP race around Goat Island in Newport, RI. -SUP drop-off is available inside the Newport Shipyard gate. Parking is available along Washington Street and in the Newport Gateway Lot across from the Shipyard (3 hours free for Newport residents with a resident parking sticker). The MOST FUN end of summer race in New England. Make the trip! Boys & Girls Club of Newport County presents the Newport Yacht Rendezvous "Club NYR" featuring the sounds of DJ Peter Hatfield to be held Friday August 10, 2018 from 5:30-10:30pm. Hosted by Newport Shipyard, this will be an extraordinary evening featuring a Super Yacht Hop, dinner, and dancing. This year's benefit will honor Anne Hamilton. All proceeds benefit the Boys & Girls Club of Newport County. Come down to Belle's Café this Sunday, July 15, from 9am-11am and shop the lululemon pop-up shop while having breakfast or lunch at your favorite dockside cafe! 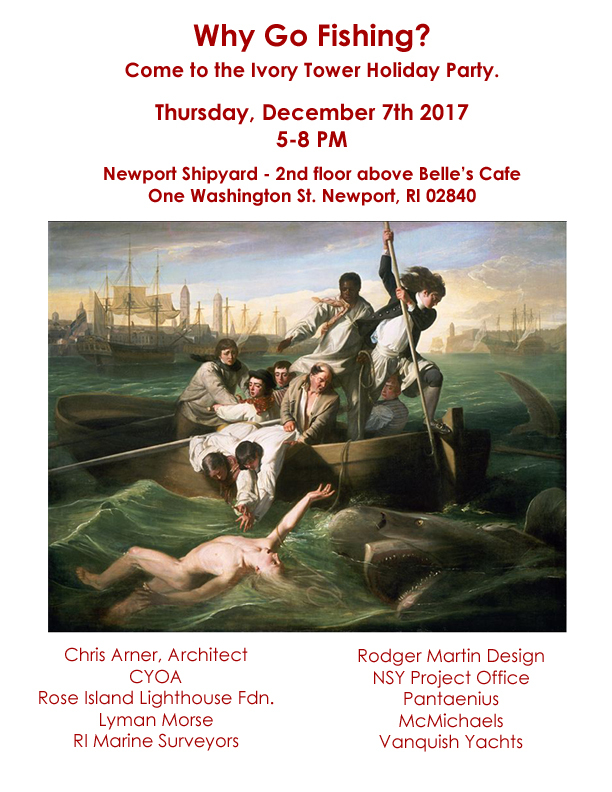 Newport Shipyard is proud to sponsor RIMTA's speaker series which kicks off on Tuesday, November 7th, from 6:30 to 8:30 pm at Newport Yacht Club. This year's theme is The Environment and Business, and the first event will feature an impressive non-profit panel of Clean Ocean Access, 11th Hour Racing, and Sailors for the Sea. Enjoy an evening of food, drinks, and networking with your industry colleagues! Tickets are just $8 in advance and $10 at the door, so get yours now! Please join Pantaenius Insurance, LEWMAR and Newport Shipyard for a cocktail party on Friday, September 22nd from 4:00-7:00pm to support Billy Black. Beverages and light food will be served outside Belle's Cafe. Sailing Heals - Lunch & Healing Sail in Newport! Newport Shipyard is proud to sponsor Lunch and a Healing Sail in Newport on Wednesday, August 30, 2017. Presented by Sailing Heals and sponsored by Newport Shipyard and Classic Cruises of Newport, guests will arrive at Newport Shipyard for lunch at Belle's Cafe followed by an afternoon of sailing onboard the schooner Madeleine. The inaugural J Class World Championship, which will be organized by the New York Yacht Club in association with the International Maxi Association and the J Class Association, will feature a mix of coastal races and windward leeward racing off Newport August 21-26, 2017. The Newport Polo Club will host a charity benefit match on Sunday August 20, 2017 at 5:00pm as a fun afternoon fund-raiser for ShelterBox USA, with fast-paced polo action and a relaxed atmosphere harkening back to the early days of the Polo Series! One of June’s most anticipated sailing events in the northeast, BACARDI Newport Sailing Week presented by EFG Bank, will return to Newport June 23-25, 2017 for a week filled with exciting sailing and shoreside festivities. The Newport edition of BACARDI Sailing Week was created based on the successful format that started in Miami. With continued support from BACARDI and EFG Bank, along with dedicated professionals from Newport Yacht Club and Sail Newport along with countless volunteers, BACARDI Newport Sailing Week, now in its seventh year, attracts sailors from all over the country. Staged at Newport Shipyard, eight one design fleets - Star, Viper 640, J/70, VX One, VX Evos, Diam 24s, A-Cats and classic day racers - will compete in three days of racing on the waters of Narragansett Bay. In addition to racing and many social events planned, there will be an exhibit at Bowen's Wharf and many other fun BACARDI events in bars and establishments throughout the Newport.